The aim of this study was to compare the effect of Wies procedure with that of Jones procedure in the primary repair of lower eyelid involutional entropion. Involutional entropion (senile entropion) is a general instability of the lid structures with age with inward rotation of the eyelid margin. The eyelashes rub against the inferior cornea and bulbar conjunctiva causing irritation. This finally leads to impaired optical function of the ocular surface. Different methods have been described aiming at treating one or several of the etiological factors of the involutional entropion. In the current comparative prospective study, 30 patients (31 eyelids) with senile lower eyelid involutional entropion without horizontal eyelid laxity were selected and divided into two groups. Group 'A' included 16 eyelids of 15 patients that were corrected using Wies procedure and group 'B' included 15 eyelids of 15 patients that were corrected using Jones procedure. In the group subjected to Wies procedure, during the follow-up period (6 months), 12 (85.7%) cases were successful, two cases were missed from follow-up, and two (14.3%) cases were unsuccessful (undercorrection in one case and recurrence in the other). However, in the group subjected to Jones procedure, 14 (93.3%) cases were successful and only one (6.7%) case was unsuccessful (overcorrection occurred). In the Wies group, nine (64.3%) cases showed cosmetically accepted results and five (35.7%) did not. However, in the Jones group, 12 (80%) cases showed cosmetically accepted results and three (20%) cases did not (P = 0.03). In the Wies group, eight (57.1%) patients were satisfied and six (42.9%) were not. However, in the Jones group, 13 (86.7%) patients were satisfied and two (13.3%) were not (P = 0.55). Jones procedure is more likely successful, cosmetically acceptable, and satisfactory to the patients compared with Wies procedure. Involutional entropion (senile entropion) is the inward rotation of the eyelid margin with age . Entropion is more common in women than in men, with a prevalence of 2.4% in women and a prevalence of 1.9% in men . Factors thought to play a role in the development of involutional entropion are dehiscence of lower eyelid retractors, over-riding of preseptal orbicularis oculi muscle (OOM) over the pretarsal OOM, horizontal lid laxity, and enophthalmos . However, enophthalmos has not been shown to be a significant factor. Surgical therapy is the treatment of choice addressing these factors, especially lower lid retractor (LLR) dehiscence ,,,,,,,. Eyelashes rub against the inferior cornea and bulbar conjunctiva causing irritation ,,,,,,. This leads to an impaired optical function of the ocular surface through chronic irritation of the conjunctiva and the cornea. Hence, early intervention is required because tear film instability, conjunctiva scarring, recurrent corneal abrasions, corneal ulceration, superficial corneal opacities, and vascularization are blinding conditions ,,. Hence, the current study was conducted. Before initiating this study, the protocol, the informed consent form, and any other written information to be given to patients were reviewed and approved by the Ethics Committee of the Menoufia University Hospital. This prospective comparative study included 30 patients (31 eyelids) with senile lower eyelid involutional entropion who were selected from the Outpatient Clinic in the Department of Ophthalmology of Menoufia University Hospital and Tanta University Hospital, from May 2015 to May 2016. The patients were divided into two groups. Group 'A' included 16 eyelids of 15 patients corrected using Wies procedure and group 'B' included 15 eyelids of 15 patients corrected using Jones procedure. Patients with primary involutional lower eyelid entropion and cooperative patients who were fit for local anesthesia were included in the study. Those with horizontal eyelid laxity, lateral canthus tendon (LCT) laxity, medial canthus tendon (MCT) laxity, and recurrence were excluded from the study. All patients included in this study were subjected to complete ophthalmic examination including digital eversion test, snap-back test, distraction test, MCT laxity test, LCT laxity test, OOM tone check test, bell phenomenon test, Schirmer test using Whatman paper (Ophtechnics Unlimited, Haryana, India), fluorescein corneal test, and lacrimal system patency test. The disinsertion or dehiscence of LLRs was evaluated. All cases were examined under local infiltrative and surface anesthesia. Approximately 2–3 ml of 2% lidocaine with 1: 100 000 dilution of adrenaline was injected subcutaneously across the whole length of the lower lid. Sterile preparation: A skin incision was marked 4 mm inferior to the lashes. Local anesthesia was induced across the whole length of the eyelid. A lid guard was placed to protect the globe. The lower eyelid was stabilized with '4–0' silk traction suture and clamped to the guard and drape. Full-thickness stab incision was made. The inferior fat pad was exposed with blunt dissection behind the preseptal OOM. The lower eyelid retractors were identified as a visible white fibrous tissue layer between the inferior fat pad and the conjunctiva. Three double-armed 6–0 sutures were applied through the conjunctiva and LLRs. Sutures were passed anterior to the tarsal plate to exit inferior to the lashes. The sutures were tied under enough tension just to evert the lid margin. The skin was closed with interrupted sutures. Skin sutures were removed after 7 days. Double-armed sutures were removed after 14 days. Sterile preparation: Skin incision was marked at the lower border of the tarsal plate 4 mm below the lashes from the punctum to the lateral canthus. Local anesthesia was induced across the whole length of the eyelid. A lid guard was placed to protect the globe. The lower eyelid was stabilized with a 4–0 silk traction suture and clamped to the guard and drape. A horizontal skin incision 4 mm from lashes was made with a no. 15 blade. The orbicularis muscle was cut. The skin and the orbicularis muscle layer were reflected up to expose the tarsal plate and down to expose the orbital septum and the underlying fat pad. The lower eyelid retractors were dissected from the tarsus and conjunctiva. The orbital septum was opened and the lower eyelid retractors were dissected. Three long-acting 6–0 absorbable plicating sutures were passed through the LLRs, through the lower border of the tarsal plate and out through the LLRs. The sutures were tied. The excess of the retractors was excised. The skin was closed with interrupted sutures. Skin sutures were removed after 7 days. Plicating sutures were removed after 14 days. P value more than 0.05 was considered nonsignificant and P value less than 0.05 was considered significant. Thirty patients (31 eyelids) with involutional entropion underwent surgical repair; only one patient had bilateral entropion. Jones' retractor plication was performed in 15 (50%) patients, five (33.3%) of whom were male and 10 (66.7%) were female, whereas Wies procedure was performed in 15 (50%) patients, six (40%) of whom were male and nine (60%) were female [Table 1]. Entropion was mild in two cases, moderate in 13 cases, and severe in one case in Wies procedure, whereas in Jones procedure entropion was moderate in 13 cases and severe in two cases [Table 2]. Punctate epithelial erosion was mild (grade 0) in two cases, moderate in 13 cases (eight were of grade 1 and five of grade 2), and severe (grade 3) in one case in the Wies procedure group, whereas in the Jones procedure group punctate epithelial erosion was moderate in 13 cases (six were of grade 1 and seven of grade 2), and severe (grade 3) in two cases. Dry eye was mild (grade 1) in two cases, moderate (grade 2) in 13 cases, and severe (grade 3) in one case in the Wies procedure group, whereas in the Jones group it was moderate (grade 2) in 13 cases and severe (grade 3) in two cases. Bell's phenomenon test was good in all cases. Lacrimal system was patent in all cases. Horizontal eyelid laxity, MCT laxity, and LCT laxity were absent in all cases, whereas OOM overaction and LLR dehiscence were found in all cases. The operation time in the Wies procedure group ranged from 20 to 40 min (mean ± SD: 30.1 ± 6.8 min), whereas in the Jones procedure group it ranged from 20 to 45 min (mean ± SD: 33.9 ± 8.7 min). The only intraoperative complication was bleeding, which occurred in two (12.5%) cases in the Wies procedure group and in one case in the Jones procedure group. During the follow-up period (6 months), in group 'A', 12 (85.7%) cases were successful [Figure 1], two cases were missed from follow-up, and two (14.3) cases were unsuccessful. However, in group 'B', 14 (93.3%) cases were successful and only one (6.7%) case was unsuccessful. 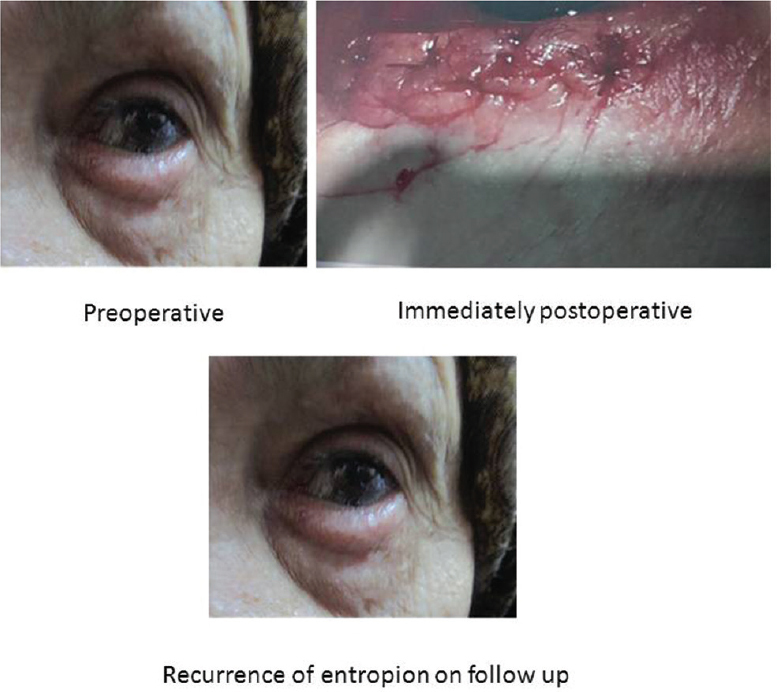 Recurrence of entropion occurred in one (7.1%) case of the Wies procedure group 6 months postoperatively [Figure 2], whereas no recurrent cases of entropion were noticed in the Jones procedure group during the follow-up period. Figure 1: Case no. 7, group A. Figure 2: Case no. 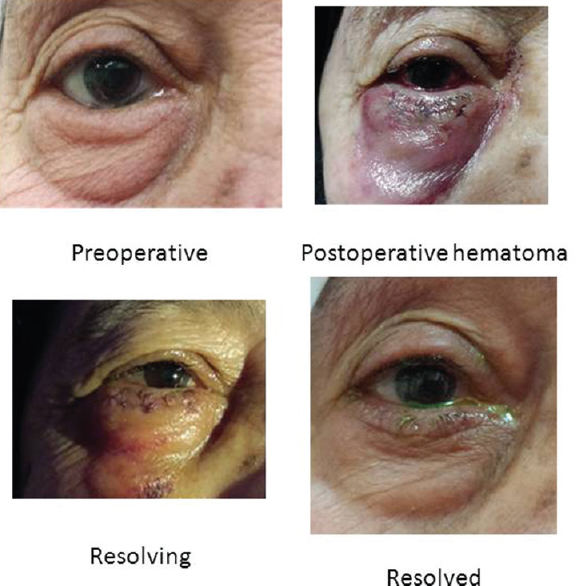 9, group A.
Hematoma in the lower eyelid region occurred in two (14.3%) cases of the Wies procedure group and in one (6.7%) case in the Jones procedure group [Figure 3]. Undercorrection occurred in one (7.1%) case in the Wies procedure group. The entropion shifted from grade 2 to grade 1, whereas in the Jones procedure group no undercorrection occurred in any case. Overcorrection occurred in one (6.7%) case in the Jones procedure group. One of the sutures (central) was removed but overcorrection was still found [Figure 4], whereas in the Wies procedure group no overcorrection occurred. Figure 3: Case no. 15, group B. Figure 4: Case no. 5, group B.
Edema occurred in two (14.3%) cases in the Wies procedure group and in one (6.7%) case in the Jones procedure group. In the Wies procedure group nine (64.3%) cases had cosmetically acceptable results and five (35.7%) cases did not, whereas in the Jones procedure group 12 (80%) cases had cosmetically acceptable results and three (20%) cases did not (P = 0.03) [Table 3]. In the Wies procedure group eight (57.1%) patients were satisfied and six (42.9%) were not, whereas in the Jones procedure group 13 (86.7%) cases were satisfied and two (13.3%) were not (P = 0.55) [Table 4]. Different methods have been described for treating involutional entropion ,,. The current study compared Jones retractor plication procedure with Wies procedure as a primary surgical intervention for repair of involutional lower eyelid entropion without horizontal eyelid laxity. In the current study, difference between sexes in the two groups was statistically significant indicating a higher incidence of involutional entropion in female than in male population. This is in agreement with many studies. In a study by Boboridis et al. , there were 41 male and 61 female patients. In a study by Damasceno et al. , the prevalence was 2.4% in female patients and 1.9% in male patients. This is due to smaller tarsal plates in female than in male populations (Bashour and Harvey, 2000). However, this is in disagreement with the study by Abdel Fattah et al. , in which the number of male patients was 20, whereas the number of female patients was six, and with the study by Sahasrabudhe and Salian , in which the number of male patients was 26 and the number of female patients was 25; however, they did not explain the cause. In the current study, recurrence occurred only in one (7.1%) case that underwent Wies procedure and no recurrence occurred in Jones procedure, indicating a higher incidence rate of recurrence with Wies compared with Jones procedure. This is in agreement with many studies. In the study by Boboridis et al. , recurrence occurred in 11 cases that underwent Wies procedure and in two cases that underwent Jones procedure (P = 0.81). In the study by Abdel Fattah et al. , recurrence occurred in one case that underwent Wies procedure and no recurrent cases of entropion were noticed in Jones procedure. In the study by Serin et al. , recurrence occurred in nine eyes that underwent Wies procedure and in only one in the combined procedure group (P = 0.001). In the study by Sahasrabudhe and Salian , no recurrent cases occurred. In the study by Simon et al. , which included 49 eyes with LLR reinsertion, subciliary incision repair was performed in 29 eyes and transconjunctival repair was performed in 20 eyes. Recurrence was noticed in four (8.2%) eyes. It was higher in the transconjunctival approach (15 vs. 3% with subciliary incision). This is due to full-thickness incision in Wies procedure creating cicatrization at the conjunctiva. In the study by Nakauchi and Mimura (2012), three cases that underwent Jones procedure reported recurrence, whereas in the combined procedure group there was only one recurrent case. The recurrence rate was 5%. In the study by Ranno et al. (2014), 10 patients who underwent the Jones procedure and two patients who underwent the combined procedure reported recurrence. In the study by Altieri et al. (2004), the rate of entropion recurrence was lower in the modified technique group (7.1%) than in the Jones technique group (14.7%). In the study by Shaheen , which evaluated the surgical outcome of involutional entropion repair with lower eyelid tightening both horizontally and vertically, no cases of recurrence were recorded. In the current study, overcorrection occurred in one (6.7%) case that underwent Jones procedure, whereas no overcorrection occurred in cases that underwent Wies procedure, indicating a higher incidence of overcorrection in Jones than in Wies procedure. This is because Jones procedure is a powerful procedure and overcorrection is a common complication . However, this is in disagreement with the study by Abdel Fattah et al. , in which no cases of overcorrection occurred in Jones procedure, whereas overcorrection was observed in one eyelid in Wies procedure, and with the study by Boboridis et al. , in which 20 (31%) secondary ectropion occurred after Wies procedure compared with four (11%) after Jones procedure, mentioning that this is a well-recognized complication of this procedure. Jones procedure is more likely successful, cosmetically acceptable, and satisfactory to the patients. Vallabhanath P, Carter SR. Ectropion and entropion. Curr Opin Ophthalmol 2000; 11:345–351. Damasceno RW, Osaki MH, Dantas PE, Belfort RJR. Involutional entropion and ectopion: clinicopathologic correlation between horizontal eyelid laxity and eyelid extracellular matrix. Ophthal Plast Reconstr Surg 2011; 27:321–326. Osaki T, Osaki MH, Osaki TH. Temporary management of involutional entropion with octyl-2-cyanoacrylate liquid bandage application. Arg Bras Oftalmol 2010; 73:120–124. Wies F. Surgical treatment of entropion. J Int Coll Surg 1954; 21:758–760. Collin J. A manual of systemic eyelid surgery. Edinburgh: Churchill Livingstone; 1989. 7–26. Quikert M, Rathbun E. Suture repair of entropion. Arch Ophthalmol 1971; 85:304–305. Hargiss J. Inferior aponeurosis vs orbital septum tucking for senile entropion. Arch Ophthalmol 1973; 89:210–213. Jones L, Reeh MJ, Wobig JL. Senile entropion. A new concept for correction. Am J Ophthalmol 1972; 74:327–329. Caroll R, Allen SE. Combined procedure for repair of involutional entropion. Ophthal Plast Reconstr Surg 1991; 7:273–277. Jackson S. Surgery for involutional entropion. Ophthalmic Surg 1983; 14:322–326. Lemke B, Sires BS, Dortzbach RK. A tarsal strip periosteal flap technique for lateral canthal fixation. Ophthalmic Surg Lasers 1999; 30:232–236. Collin J, Rathbun JE. Involutional entropion: a review with evaluation of a procedure. Arch Ophthalmol 1978; 96:1058–1064. Scheie H, Albert DM. Distichiasis and trichiasis: origin and management. Am J Ophthalmol 1966; 61:718–720. Cook T, Lucarelli MJ, Lemke BN, Dortzbach RK. Primary and secondary transconjunctival involutional entropion repair. Ophthalmology 2001; 108:989–993. Rainin E. Senile entropion. Arch Ophthalmol 1979; 97:928–930. Dryden R, Leibson J, Wobig J. Senile entropion. Pathogenesis and treatment. Arch Ophthalmol 1978; 96:1883–1885. Boboridis K, Bunce C, Rose GE. A comparative study of two procedures for repair of involutional lower lid entropion. Ophthalmology 2000; 107:959–961. Abdel Fattah ME, El-Sayed EMEH, Abdel Kader KSED, Abdel Badia SM. 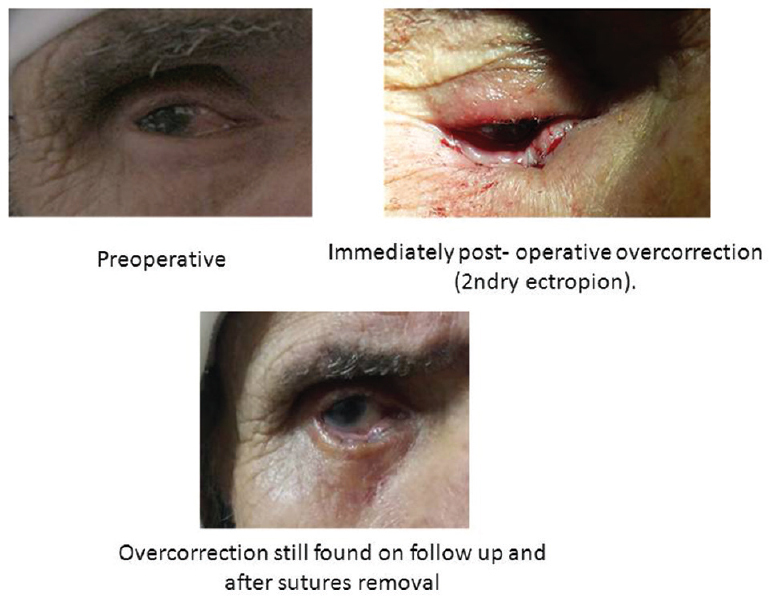 Wies operation with horizontalshortening versus retractor tightening with horizontal shortening for management of lower eyelid senile entropion. Discussed thesis in Zagazig University, Egypt 2007. Available from: http://www.publications.zu.edu.eg/Pages/PubShow.aspx?ID=18624&&pubID=19. [Last accessed 2016 Jun]. Serin D, Buttanri IB, Karslioglu S, Sevim MS, Buttanri B, Akbaba M. The efficacy of the combined procedure in involutional entropion surgery: a comparative study. Korean J Ophthalmol 2013; 27:405–408. Ben Simon GJ, Molina M, Schwarcz RM, McCann JD, Goldberg RA. External (subciliary) vs internal (transconjunctival) involutional entropion repair. Am J Ophthalmol 2005. 139:482–487. Shaheen MAE-F. Surgical correction of involutional entropion by lower eyelid tightening. Tanta Med J 2006; 34:484–489.